It’s fitting because we at Two Cities are just getting started and today was pretty epic. People gave their lives to Jesus, surrendering to His will in their lives and saying, “I’m not going to run from you anymore.” I simply don’t have words for the many emotions I felt today. All I know is, we are in the right place, doing the right thing, at the right time and I wouldn’t change it for the world. Happy Valentine’s Day from Two Cities Church. We love to have a great time with popular music. It’s actually one of our goals to do a popular song every week. We want to be able to connect with anybody who walks in the door right away through music. It’s part of our church-plant culture. This past Sunday was no exception, we played Gone, Gone, Gone by Phillip Phillips. Enjoy Paul Haugen and Jill Douty singing together during rehearsal before service. You can play our entire playlist here on Spotify or download them on iTunes. Our next service is March 16 at 5pm, for details click here. “Thoughts in a prison” an atheist prayer by Micah Prewitt. Many people face this question when they feel forgotten or overlooked by God. Some people face a faith crisis when circumstances seem to be out-of-whack with what we’ve been taught about God or His character. It doesn’t take much research or googling to see all the awful things happening in the world and so it doesn’t take a genius to know at some point we’re all going to face this kind of question and perhaps say a skeptical atheist prayer. If you’re a Christian and never had a faith crisis, you’re faith is on shaky ground. You’ll have a faith crisis one day and if you have the courage to ask God this question and you come out the other side with your faith intact, your faith will be undeniably solid. So tell me. Has your faith weathered the storm? Have you come out stronger? Have you lost faith altogether? Be honest. I want to hear your story. Sometimes Christmas carols can get a little old, especially when you’ve been listening to the same ones for over a month everywhere you go. But North Point Community Church in Atlanta, GA has solved that problem with “The Best Carol Ever”. At Two Cities we play popular music at the start of our services for the purpose of creating common ground with everyone in the room. Here’s a sample of that music from our second service that took place on Nov 17, 2013. Keep up-to-date with our events by clicking here. Mauro and Chelsea DeBenedetto are a part of our launch team at Two Cities Church. I met them just a couple of months ago. They didn’t know anyone on the team and are now they’re very involved. They also just released two singles available on iTunes [read about that here]. Enjoy their story. Tonight Brynn was introduced to a keyboard. I was immediately impressed with her precision. She may be a future musician. Remember when I told you about Mauro & Chelsea? 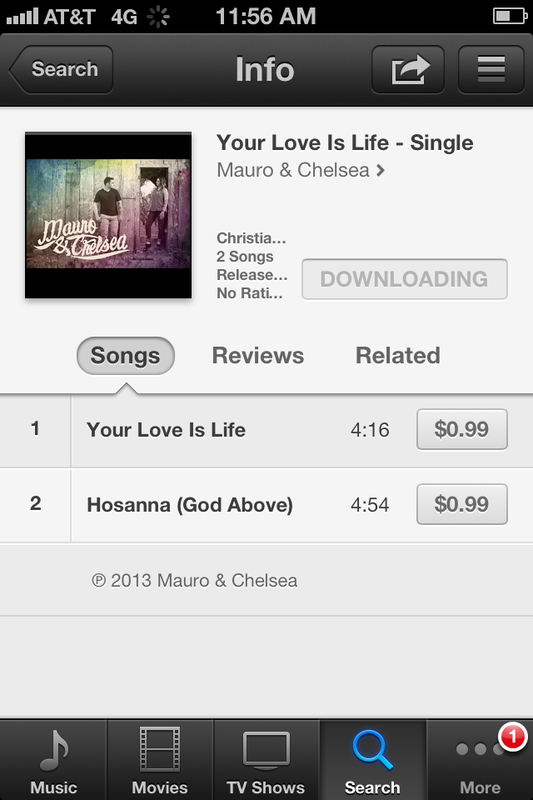 Today Mauro & Chelsea’s two songs you should buy on the iTunes store. They were produced by Joel Piper and they sound awesome. Soon their kickstarter project will go live and I can’t wait to see what happens after YOU fund their project. Go show them some love and purchase their two singles here. I bought mine today and you should too. I mean it’s $2… go get it, now.